Performance | The Virginia Tech Foundation, Inc. Between July 1, 2017, and June 30, 2018, the value of the foundation’s assets grew reaching a total of over $1.9 billion. Expenditures in support of university projects and programs were $179.6 million, an increase of 9.3 percent compared to the previous fiscal year. 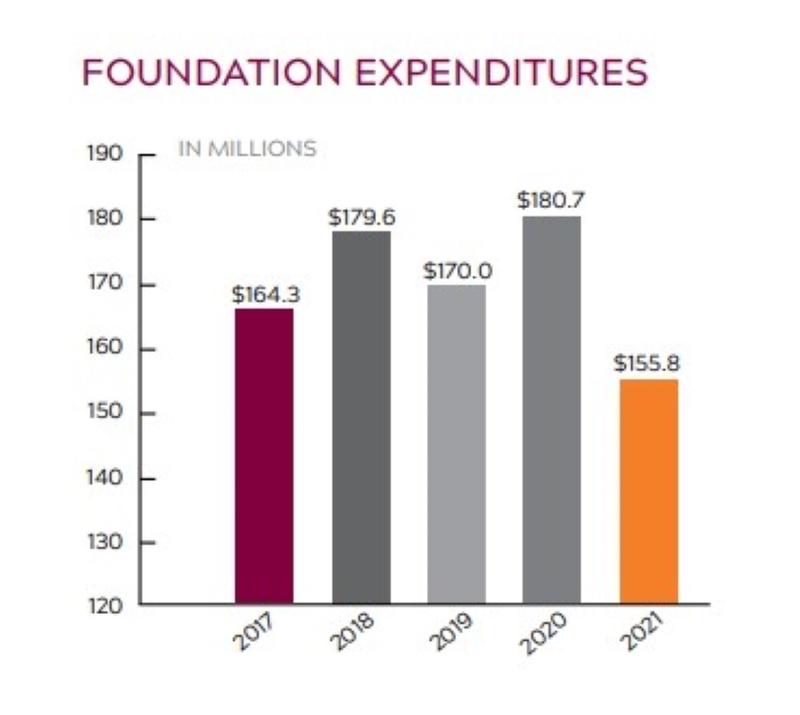 Foundation net revenues were $266.6 million. The value of the endowment reached a record high of $1.15 billion. 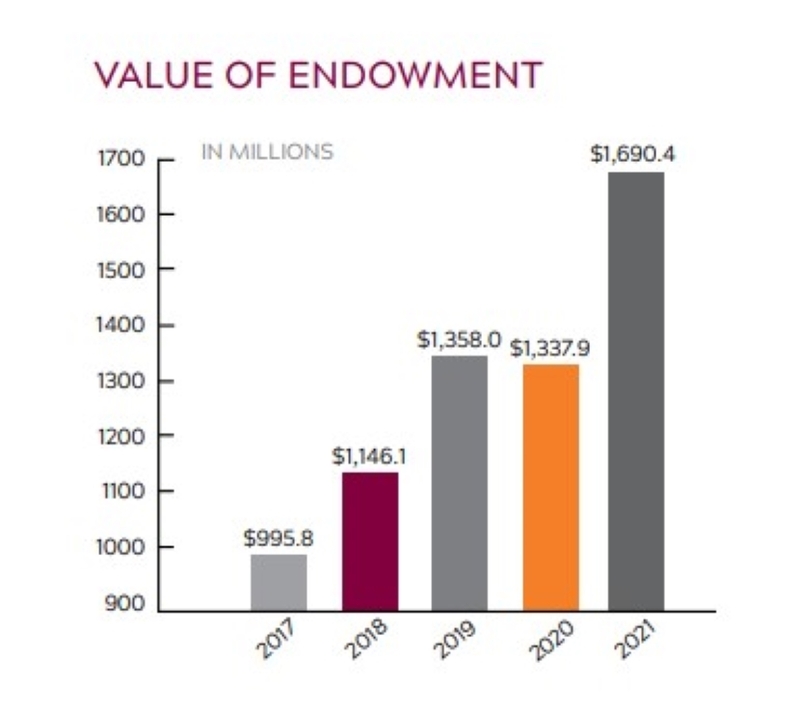 As of June 30, the market value of all endowments held by the Virginia Tech Foundation Inc. totaled $1.15 billion. 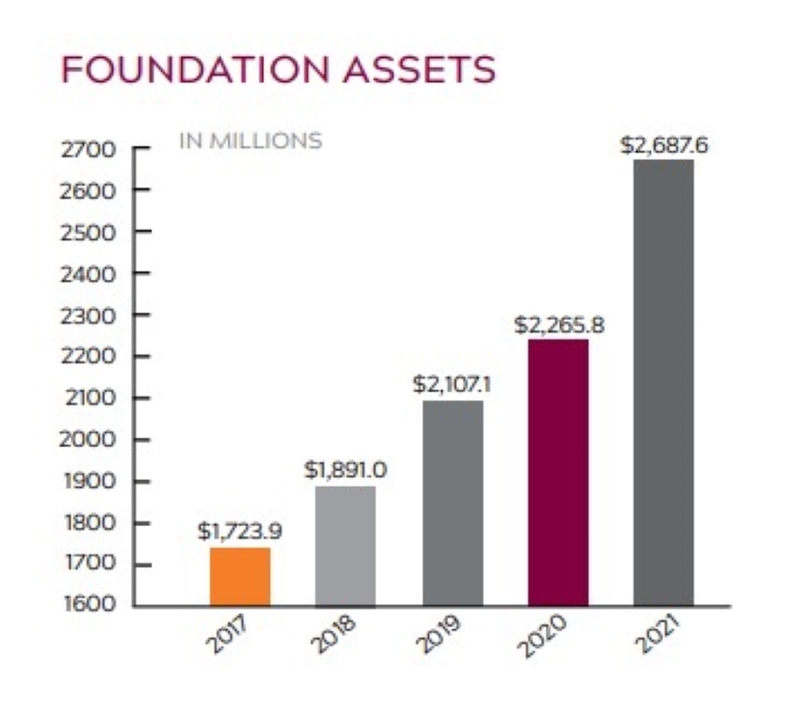 Of that total, $1.09 billion is invested in the foundation’s pooled consolidated endowment fund, while $57.5 million is held separately in notes, deeds of trust, gift annuities, contributions receivable, real estate partnerships, and miscellaneous other endowed assets. 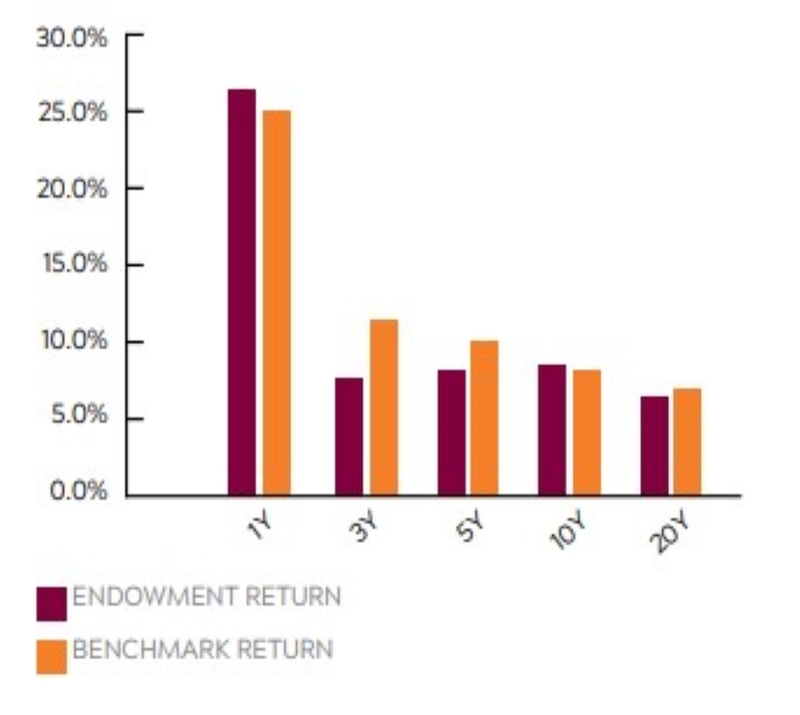 The June 30 allocation of the foundation’s pooled endowment fund consisted of 56.1 percent global equities, 7.9 percent real assets, 16.0 percent credit, 0.2 percent government bonds, and 19.8 percent cash. The fund achieved a total return of 7.3 percent for the year ending June 30, and an annualized return of 8.7 percent over the trailing five-year period. The foundation’s real estate portfolio includes properties ranging from innovational to academic to recreational. It supports initiatives targeting economic growth, technological advancement, and business creation. WVTF journalists have earned recognition from the Society of Professional Journalists, the Radio Television Digital News Association, and the Associated Press for their coverage of local and regional news. Total population coverage now reaches over 2 million listeners, and the weekly listenership estimate at more than 170,000. Fiscal year 2014-2015 saw the completion of signage renovations and the creation of both a linear park along Gilbert Street and a plaza area between 400 and 460 Turner Street. These pedestrian-friendly enhancements increased the curb appeal of North End, helping its efforts to be an attractive location for shopping, dining, and enjoyment. North End retail occupancy has increased to more than 94 percent. The popularity of the Pete Dye River Course of Virginia Tech for daily play, special events, and conference/social events continued to expand, and the course continues to be recognized for excellence. Golf Week magazine rated it as the fifth best course in Virginia and The Roanoke Times declared it Best Course in the New River Valley. The River Course hosted more than 60 tournaments—comprising over 2,500 rounds of play, combined. These included high-profile tournaments such as the Hurricane Junior Golf Tour Championship and the College Prep Tour, as well as charity events to benefit organizations including Special Olympics and Wounded Warrior Project.The River Course was selected as the location of the Virginia State Golf Association Amateur Championship for 2016, when it became the first public course to host the event since the championship was initiated in 1904. Thirty-three years have passed since the Virginia Tech Corporate Research Center began growing businesses that matter, but recent progress indicates that the organization shows no signs of slowing down. More than 3,000 people are employed within the CRC’s 33 buildings in Blacksburg, which, combined, provide more than 1.2 million square feet of space. The Hotel Roanoke achieved record results in Fiscal year 2018. Renovations to the hotel's lobby, meeting rooms, and public spaces were completed. The hotel received a Four Diamond rating from AAA, and won a highly competitive event, lodging, and catering contract with Volvo to support the introduction of a new truck, which drew visitors and guests from around the world. And in just the second year of its hotel carrying Hilton's prestigious Curio brand, the Virginia Tech Foundation won a Hilton Owner Award as the top performer for the small portfolio category within Curio.